Maréchal Pétain’s journey from war hero to traitor was so complete that it surprised those who had not kept abreast of developments. The result was a rather surprising encounter between Charles de Gaulle and General Pershing. General John J. Pershing was the great commander of the American forces in World War I. He led the US efforts on the western front alongside Maréchal Pétain (Commander-in-Chief of the French Army) and Field Marshal Haig (Commander of the British Expeditionary Force) and under Generalissimo Foch (Supreme Commander of the Allied Forces). In 1919 he was promoted to General of the Armies, the highest rank ever attained within a lifetime. At the same time Charles de Gaulle finished the First World War as a captain – a world away from the top brass. 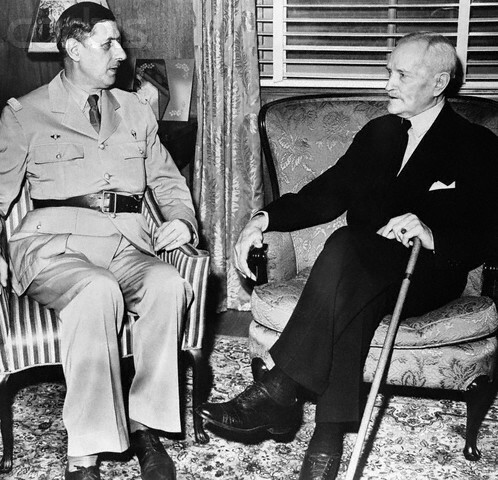 It was therefore understandable that, when visiting Washington D.C. in 1944, de Gaulle was keen to meet the great American warrior. Pershing was 83, and lived in the Walter Reed Army Medical Centre in the north of the nation’s capital. He had only four years left to live, and had entered his dotage with a time-fogged mind. The question was met with a brief, stunned silence. The honest answer would have been that Pétain was barely holding onto power in the collaborationist regime of Vichy France. Barely three months later he would be relocated by his Nazi masters to Sigmaringen in south west Germany to lead a ‘French’ government in exile. A year later from Pershing’s innocuous inquiry and Pétain would be on trial for treason. It was a remarkable reversal of fortunes for the two men. On 2 August 1940 de Gaulle had been sentenced in absentia to death for treason to the Vichy Republic. Just a little over five years later, and Pétain faced the same penalty. Convicted to die by a majority of one, the ‘saviour of France’ was himself saved by de Gaulle’s presidential decree, living his remaining six years in prison. “La dernière fois que je l’ai vu, il se portait bien” (the last time I saw him he was doing well).